Drogheda Cook says: "From left to right, Tim Hooper, Luke Figlewski, Andy Snow and myself. 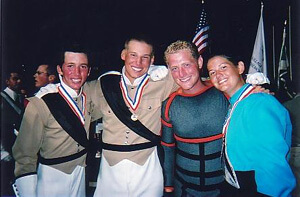 We all went to Durant High School (Plant City, Fla.) together and all marched in the 2002 season. We have known each other since about 6th grade. It was always nice to know that at any given show we could possibly find each other. Finals night was awesome, and it was great for all four of us to be there. "I was the field conductor for Spirit last year (2002 season). I am a photography major/percussion minor at Jacksonville State University, and I plan on marching with Spirit until my age-out year in 2005." Thanks Drogheda! We've run into a few technical problems over the last week, so if you haven't seen your Forzato Picture of the day yet, send it to us again and we'll run it as soon as we can. E-mail it to dave@dci.org along with where and when the photo was taken, and send some biographical information about yourself as well. We'll give you full credit. Also, let us know if you want your e-mail address included, to get feedback from other drum corps fans.